So earlier this week I read a heart-breaking blog post that described a student’s journey of their PhD. This one was different, however, it didn’t discuss research. This one discussed mental health. This topic is the ‘taboo’ topic of research as quite often you find that people don’t talk about this at all. Students don’t talk about it with their supervisors, with each other and even don’t admit it themselves if they feel there is something not quite right. I think this is a really important topic, not only as I have a Clinical Psychology background, but because I have been with those who have needed support, students who have need help. Students who have asked for help and get it. I have been the one who was there through all the pain, when they felt like they could not cope. Could not cope with everyday things like planning their study and finishing an assignment, I was there. It’s what broke me I suppose before I left. Now there are many types of mental health problems that could arise and affect a student. This could be from anxiety, depression and, imposter syndrome (yes, there is such a term!) to things which could be life changing or life ending such as self-harm and suicide. These are the most common ones but they are not exclusive, and there is definitely not a set list. Each student is different so any psychological-related issue that is a direct results of research or a PhD should not be ignored and I am going to share some of my thoughts on this during this blog entry. So in the blog entry that I read earlier this week, the writer discusses how they were at breaking point and came to make THAT decision not to do it. I could assume it is not an easy place to be and not an easy question to think and to be as close at this writer was to ending it is more common than you think. You will never know unless you discuss the issue, which is one of the most important things to take away form this is nothing else. Now I have not been in that situation myself, but I headed down that route. Late 2014 I decided to be clever and get admitted to hospital as I had a blood clot in my lungs, and suddenly one day in the car park at work – I could not breathe. Luckily I was able to call for help and go to a hospital, but I think that’s where it started. I scared myself stupid wondering if it would happen again and within the first few days of discharged form hospital (and given the all clear) I had myself so frightened that I then had to take more time off work. After seeking help from my GP, he decided that I had scared myself silly, and told me to take time off. I then got a telling off for returning to work the day after getting discharged from hospital as I was worried about getting behind at work. I should have just taken time off that I now know! Anyway, to cut a long story short, I did not rest and as a result I wound myself up so much that it started affect my job. I think that is where it all started. I had to call my boss and explain what the doctor had said. That’s what made me worry more. Her question of ‘Do you want me to put that on your absence form?’ made me question what on earth she was thinking and why she was asking me that. Then it dawned on me. How could I be an Assistant Psychologist and have what was technically classed as a mental health problem, albeit a little one? Was she questioning my ability to function as a human being or was she just trying to keep it quiet so I could rest. It turns out, it didn’t really matter. Only two months after, I had had enough. My work had slipped and my heart was not in it so that was it. Gone. Sometimes people say that leaving a permanent full time job is stupid. I disagree. If something is making you ill, think negatively and not love what you do, get rid of it. In my case, it was addressing the problems with my job and my employer did a nice job or helping me out the door to make me realise what was wrong and help me love what I do again. I think for me, that was the best and worst part – knowing I was leaving a career behind but also knowing that it was the end, the end of my unhappiness and the beginning of something new. I then moved to a job in the National Careers Service which I loved and thrived on, which in combination with my voluntary research internship, lead me down the path of applying to do a PhD. I think going through that process before getting the PhD was probably a good thing. Now I can recognise if I am not happy and I know I can go to my supervisors and tell them why. One thing which is really important if anyone ever feels lost in the land of research, tell someone. Chat, moan and cry. That pretty much sums it up. When embarking on a PhD one of the most important things is the influence of the supervisory team. They are not only there to shape the research but they are there as a vital source of support. Your supervisor is not going to look down upon you (or they shouldn’t if they are a good supervisor) for saying you have a problem and you need help. It’s a big step in getting that help and if asking for help is the worst part, then so be it. What could be worse? Dwelling on your worry and stressing over unnecessary things. One thing that the recently red blog did mention was the training of supervisors to sport things in their students which could lead to problems. These could be spotting signs of anxiety, substance abuse and even if the student is becoming (or feeling) isolated. Research is a very independent thing where the student needs to be self-driven so if isolation creeps in then this could impact on the necessary things like motivation and once it’s too far gone, you will never be able to get it back. I think an important thing is being open with your supervisory team, not necessarily broadcasting all of our issues in every meeting, but if you have one supervisor (or a lead supervisor) that you feel you can talk to then do it. The moment you don’t is the moment you deny that there are any problems and could be the beginning of the end of the PhD. I don’t really believe that a PhD supervisor can be trained to spot every sigh of a mental health problem, well unless it’s a clinical or mental health PhD, that might be different. But they work with students every day and will get to know you as a person and get to know when something is not right. A good supervisor should ask you if all is okay, even if they are detecting something that is normal to you. One thing that you might find worries students is the ‘what am I going to do after my degree?’ question. This can be a big worry. Academic and postdoctoral positions are quite scarce and finding one which is suitable may take some effort, so yes, students do worry. My advice to you: make use of university careers and guidance services, discuss opportunities and ideas with you supervisor too. A PhD is a development opportunity as well as apiece of research, so if its anything like mine then the research is just as important as the skills you develop. Form an ex-careers adviser’s point of view, those who ask for help often benefit from it compared to those who it is forced upon. You have more choice and options as well as being able to guide your own support so don’t be ashamed to take options and seek advice, it’s what makes the process of development so important and so rewarding at the same time. Anyway, I think I have written enough for today. If nothing else, please take away the following message: A PhD is hard, independent and a journey and a half… and it scares me that I am less than two months in. Make it worthwhile and make it yours. Seek help where necessary and work within your supervisory team and support networks to be happy. Heck, it’s going to be a learning curve overall and not everything will be hunky dory but if you know how to deal with the bad times, the good times will only feel better. For now, that is me. But I do hope you will read this and share it around as the more we know about this now, the less we need to know about it when it’s too late. With my topic of research being workplace learning and partly knowledge management, I feel it would only be fair to dedicate a blog post to this. To make it different, I am going to explore what it means to me to learn and reflect upon my learning experiences this week in what I have learned from working my way through another week of research degree study. 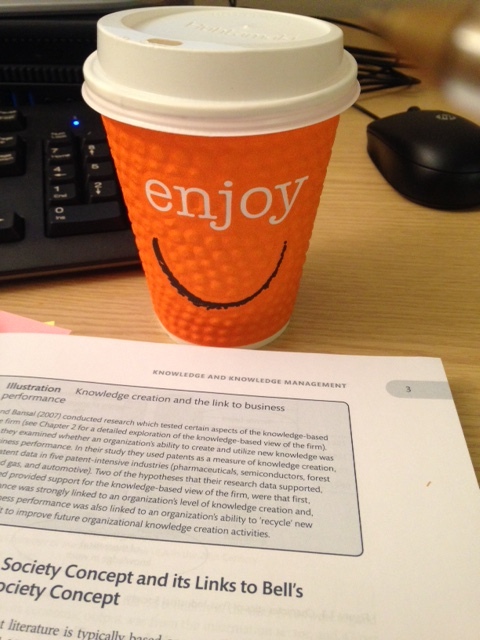 So anyway, this week I have been doing a little background reading around my two topics of interest: knowledge management and organisational / workplace learning. I came across this interesting chapter in a book called Knowledge Management in Organizations, a critical introduction (Hislop, 2013) that discusses the links well in terms of how organisations learn. As I have been on my own ‘journey of learning’ this week, I decided to reflect upon my readings and explain what this chapter means to me as a research student and also discuss some of the important parts in the book at the same time that I will be incorporating into the literature aspect of my research write-up. So there will be a lot of thought and reflection in this piece of writing, and a lot of opinion (except the theories discussed form the book, obviously) but to make a true understanding of what the meaning of learning is to you, then please do read this chapter and see what you think. The book: The book overall discussed important aspects of knowledge management and leaning within organisations, giving specific focus to approaches and aspects of what knowledge management is and how it can be used by organisations. One main focus in chapter six explored the relationship between knowledge management and organisational learning, that is, the learning done within the organisation. To me, this could reflect the learning’s that are occurring right now during my research degree. I am in an organisation (Edinburgh Napier), I am leaning. Could this be what we mean? In chapter Six, Hislop explores many aspects of learning, more importantly its meaning. He explains that learning is diverse and is difficult to define, not only in terms of what learning means but also the heterogeneity of methods that are used to explore the meaning. To me, learning might mean something different to another person. It all depends on how it is interpreted and felt. There is lack of theoretical consensus on what learning is, so there tends to be definition to how learning can be characterised rather than giving one single theory or even cause. These typologies are very hard to empirically test in terms of what they actually mean so many researchers tend to refer to certain taxonomies and approaches to learning rather than test one specific notion or framework. There has been a lot of debate over the years over what approach to use, whether it be behaviourist, modifying behaviour through a learned response, or cognitive, learning by using cognitions such as evaluation and judgement. Regardless of approach studied, learning is a subjective entity and is exceptionally individualist in that every person may feel as though they lean differently, both in terms of what they learn and more importantly how they learn. Learning can occur through a wide variety of processes and involves various mechanisms. Thus, it is difficult to characterise these and conceptualise what is actually involved and what the official outcomes are in terms of learning. This could be a turning point for my research I suppose. Should I focus on what learning really means to an organisation and link this into what individuals think could make learning better, or should I just do what other researchers do and avoid this completely??? As we go along the chapter, Hislop explores leaning types, and explores questions learning could consist of. There are mainly three distinctive types: learning via formal training and education (such as employees being trained on new procedures or policies), learning via the use of interventions in work processes (so introducing a new piece of software and measuring how employees use it) and learning that occurs which is embedded in day to day work activities and how people reflect upon these. The final aspect is one aspect which will be an important aspect in my research. Whilst writing this, I question how can leaning not take place during day to day interactions? I feel that this is learning. This is what we take away from it. This is our interpretation. So for example, if I passed a fellow student in the corridor and explained I was having trouble with searching for an article, and they explain what they had done, could I assay I have not learned anything? Would I not then go and try out what technique they had discusses and see the outcome for myself? Would that class as learning in the ‘workplace perhaps? For me, learning is knowing what we wish to know (knowledge) and encountering things that help us do so – whether they be formalised or informal encounters. So for example, a procedure, some information or even a concept that we wish to learn. This is what my research journey is about. Every day I am learning more and more, not only about the literature involved, but about the practicalities of being a research student itself. I am learning that no matter who I encounter and what I come across, I learn something from it. So take this week as an example, my task was to fill in a funding application for the John Campbell Trust to hopefully attend a conference summer. I had never done this before and panicked as I had no idea who to ask for help. Luckily, my supervisor had pointed me in the direction of a fellow research student in her absence who could potentially help (she is attending events in Canada and the USA and has been blogging her own ideas too – most likely on a learning journey herself). Anyway, through interacting with my colleague, searching websites, emailing people and the odd chat on social media, I found myself working through the application at a good speed. I learned that if you ask for help, then you will get help (yes, it might take a little persuasion and perseverance I know!). But if you don’t then you won’t. My main fear was that I would not be able to compete the work by the specified deadline and this kind of drove me to ask for help. I used to be the type of person who would just not ask for help at all and who viewed it as a weakness of myself if I did. My role as an Adviser for a careers service changed that completely. I learned the importance of interacting with colleagues, gaining new knowledge and passing on my own knowledge to new trainees. It’s important, it really is. 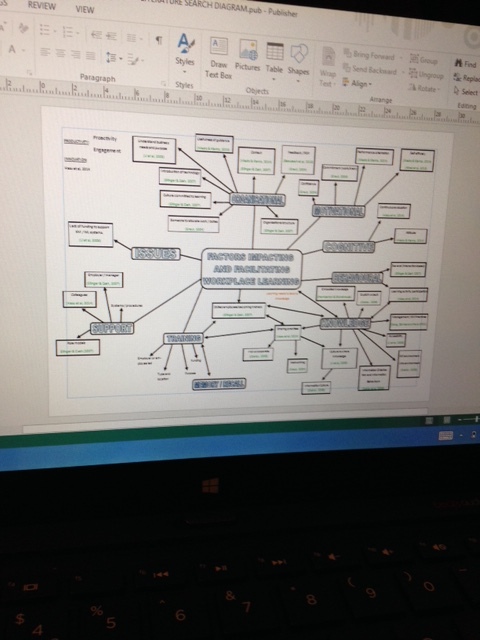 One issue that did arise, what that I found I did not learn well through a technique known as ‘death by PowerPoint’. * I learned better though interaction and showing people what I learned, so that it solidified my own knowledge on the topic as well a showing this to someone else. This taught me that everyone is different in terms of how they learn and this is important in my research now. I need to encapsulate these individual differences within my research and find out if this is important or not. If you would like to know more on Hislop’s discussed models, please read pages 87-89 for more in-depth discussion on this. Shortly after, Hislop discusses how leadership style is a central aspect to being able to create a supportive and encouraging environment for employees to learn. He pays particular attention to the cyclical nature of this in that leaders are there to be teachers as well as learners and often have roles as coaches or mentors with the organisation (p.93). They are there to stimulate growth of the employee but at the same time keep employees on the right track and ‘manage them’ where necessary. This links in well with the development of a research degree. A research degree is structured in that the individual employee (research student) is being taught, mentored and managed by the supervisory team – in a weird sort of employment sense. It is the working relationship between these individuals that is key to success of achieving the aimed research degree (plus the hard work, research and writing of course!) and the supervisor must be there as a source of knowledge and management as well as a source of encouragement when the learner is requiring support. The supervisor must be truthful, evaluate the student continuously but at the same time ensure that the student fulfils expectations of the research studentship in becoming an independent research and in my case, develop aspects (skills and qualities) of the Research Degree Framework that the degree proposes throughout. The final factor that Hislop discusses in relation to organisational learning and learning organisations is one of the most prominent – emotion! Specifically, the role that emotion and attitudes play in shaping the learning process. There are both positives and negatives to this. The positive side being that successful learning provokes emotions which leave the employee feeling appreciated and invigorated. For example, having ideas heard, receiving feedback and feeling valued as an employee. It can also increase confidence and self-efficacy in being able to achieve tasks and knowing that you can do it. That’s brilliant. However, it is now always bight and shiny in the land of work and learning. What happens when we don’t succees? Often, negative emotions can play a part and employees may feel discouraged or unappreciated. They may receive negative feedback and the leader might not be constructive about it leaving the employee in a state of worry and uncertainty. They may even not be able to achieve a goal set or find something difficult like I did. Hislop explains that learning is a process that will most likely invoke both sides of the emotions, both positive and negative, and it is more how these are dealt with (and what we take from this) that influence the learning process. For me, the beginning of this week as not particularly pleasant. I felt like I did not know what to write for the funding application which initially impacted on the way I viewed the rest of my work – I didn’t see the point if I couldn’t master one simple thing. However, when I asked for help, this changed. I felt a sense of achievement when this was complete it and actually realising that I had overcome something I initially struggled with (and nearly brought me to tears with frustration) was actually just part of my own learning journey. I am all fully aware that there will be several ups and downs, and my supervisor reassured me that she is there when things get tough and I burst out crying (because you know, it will happen). She has supervised many students so knows it will happen and quite honestly she can probably predict when it will too. It’s most going to be part of my own ‘learning journey’ and the more challenges I encounter now, the more things I will learn in the long run, especially if I can pick myself up, move on and LEARN from it. The creation of learning cultures and the organisational culture of learning – if an organisation supports learning and provided the necessary means to do so, this may support an individual to learn (Ellinger and Csech, 2007). This could reflect an academic department who pride themselves with the learning culture of research. Getting feedback and using a personal development plan may help reflection of employees so they gain an idea of what they have learned (Beausaert et al, 2013; Eraut, 2004). We have regular reviews, some we can learn from and all we can reflect on. A flatter organisational structure is often more productive of a learning organisation (Hislop, 2013). The lack of hierarchical nature means that often, lower level employees are made to feel welcomed and encouraged to be able to discuss issues and suggest ideas without the fear of being reprimanded or sanctioned. Employees may benefit form a working environment where they are encouraged to participate and be creative, viewing their opinions as being valued. As a research team, if your supervisors look down upon you instead of being a support network then this can only end badly. Self-efficacy – the ability to have faith in yourself and know you can achieve a goal that is set or a task that you aim to do. This could link in with emotions and attitudes, as to how well you feel you are progressing (Mesto and Kianto, 2014; Allred et al., 2013). *So many PowerPoints shown to you that you stop absorbing information and gain no knowledge whatsoever (and often cannot recall what you have been looking at). **references taken from other articles, not just this book chapter.